Share "Rent what you need for the Best Outside Holiday Party"
Andy Williams first said it best in 1963 with his hit tune, ‘It's the Most Wonderful Time of the Year.’ No holiday season is quite complete without this famous anthem and neither is your annual holiday party that all of your friends, family, and co-workers look forward to every year. Yet, no holiday party is complete without the proper help and outside décor. So what do you do when you are in need of decorations, lights, and tablescapes, but nowhere to store any of it for the rest of the year? The answer is you rent what you need. Let’s face it, it is a wonderful time of the year, but its also one of the most busiest times of the year. The key is to do more while actually doing less. As you begin to holiday shop this season, plan the holiday party, send out invitations, and bake countless amounts of your secret recipe cookies, its important to realize when you should DIY, and when you should get help. Renting what you need for the best outside holiday party is a good start. Think tables, centerpieces, tents, space heaters, preparation time, and clean up time. If you really give it some thought, that is a lot of work to do by yourself especially if you plan on having more than twenty guests. There is only so much one person can do ahead of time, so why not save yourself some of the trouble and rent your decorations and supplies for your next party. The idea is to minimize your efforts so you have not exhausted yourself before the party even begins. Remember keep everything simple. Before the party, during the party, and even after the party, you are going to be far too busy to worry about every single guest and every single detail. 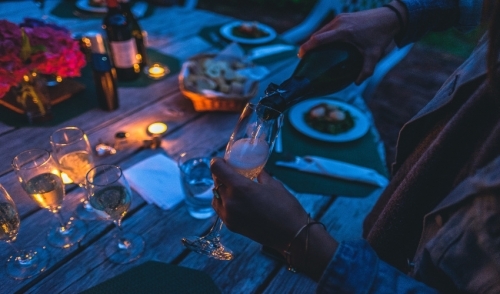 Make your party easier on yourself buy doing what you can when you can, and leaving the heavy lifting to the professionals. We have been to our fair share of holiday parties and one word separates the good host from the person who swears she will never have a holiday party again: Help. The fact is the larger the party, the more help you will need and the more décor you may have to rent. Thankfully, there are plenty of affordable ways to transform your holiday party into a winter wonderland where everyone can enjoy themselves, including you. Do not hesitate to look beyond your family and neighbors for help with your party. Its an important event and should be given the proper attention without sacrificing your own schedule or personal enjoyment. Always remember, you do not have to own everything at the party for it to be yours. You may be pleasantly surprised how much fun you will have at this year’s party when you seek a little outside help.